For most people, they may not be allergic to insect stings. However, it is imperative that everyone learns how to recognize the difference between a normal reaction and an allergic reaction. This helps prevent unnecessary medical expense and reduce anxiety. At ENT for Children, we have many years of experience in treating insect sting allergies so you can count on us to get your child out of the red zone. What Are Insect Sting Allergies? Brown or black hornets with yellow, orange, or white markings: Build brown or gray nests in trees. Honeybees: They feature fuzzy and round bodies with yellow and dark brown markings. Their nests can be found in partially protected sites such as old tires, trees, and more. 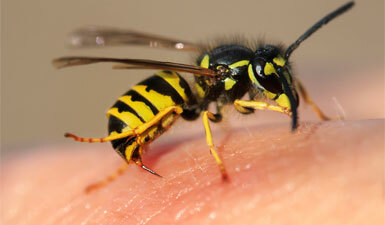 Yellow jackets: They are usually in black and feature yellow markings. They can be found in various climates and their nests are often located underground. Paper wasps: This type of wasps is slender and feature yellow, red, brown, and black markings. They can be found living in circular combs under eaves. Fire ants: These ants are reddish-brown in color and live in large mounds. They are known to attack with little warning, releasing highly concentrated toxins through bite points. What Are The Symptoms Of Insect Sting Allergies? Normal reactions set off pain, redness, and swelling around the sting site. Larger local reactions can cause swelling that extends beyond the sting site. For example, a person’s entire leg can swell after being stung on the ankle. While it may look alarming, it is usually no more serious than a normal reaction. The reaction can last up to 48 hours, and may take up to 10 days to fully heal. Finally, the most serious reactions are allergic ones. They need to be treated without delay. Oftentimes, the presence of a cluster of symptoms following a sting is often sufficient to establish the diagnosis of an allergic reaction. If you are unsure whether or not the individual is having an allergy to stinging insects, it is pertinent that you consult an ENT specialist for testing. Blood tests and skin tests are the two major types of tests used to determine whether or not one has an allergy to certain types of stinging insects. How Are Insect Sting Allergies Treated? If your child is not allergic to an insect sting, but is stung by a bee, you should remove the stinger within 30 seconds. This prevents the sac of venom from releasing any more of its contents. Next, you will need to gently scrape the sac and stinger out with a fingernail or something stiff like a credit card. NEVER pull on the stinger or squeeze the sac, it will pierce the skin deeper. The following steps involve cleaning the stung area and applying an antiseptic. If your child is experiencing a severe allergic sting reaction, epinephrine is needed and can be administered before calling 911. All in all, the patient requires emergency medical care, even if his or her symptoms seem to stop.